XDCAM EX is a focus of continual innovation and development, from IT-friendly MP4 file recording and advanced creative features, through to accessories such as SxS-1 low cost media and an adaptor enabling the use of high-speed Memory Sticks™. The PMW-EX1R camcorder offers a choice of bit rates - either 35 Mb/s (HQ mode) or 25 Mb/s (SP mode) - depending on the desired picture quality and recording time. The HQ mode supports 1920 x 1080, 1440 x 1080 and 1280 x 720 resolutions. The 1440 x 1080 mode is new to the PMW-EX1R ensuring native integration of XDCAM EX footage into a XDCAM HD Professional Disc workflow. By supporting 1440 x 1080, 35Mb/s recording, material can be utilised with no transcode, just a re-wrap to MXF for NLE and archiving. The SP mode supports 1440 x 1080 resolution at 25 Mb/s, which provides compatibility with HDV 1080i products.Footage recorded in this SP mode can be seamlessly integrated into HDV-compatible editing systems by transferring the stream from the camcorder via the i.LINK™ (HDV™) interface. The PMW-EX1R also supports 25Mb/s DVCAM recording in either PAL or NTSC modes, again providing seamless integration into existing DVCAM workflows offering ultimate flexibility worldwide. 3. Large storage capacity: SBP-16 (16 GB) and SBP-32 (32 GB) memory cards are available. Sony and SanDisk Corporation jointly developed SxS PRO for professional content creation applications. SxS-1 was developed by Sony. Utilising a mature and highly efficient compression format together with high performance SxS memory cards, the PMW-EX1R can record superb quality HD images for an exceptional 140 minutes* on a single 32GB SxS card. As the PMW-EX1R features two memory card slots, this recording time is easily increased to 280 minutes (with two 32GB cards) and when recording across two cards, the transition is seamless without any frame loss. This feature makes the PMW-EX1R an ideal camcorder for a wide variety of content production applications, including wedding and event videography, that require a long recording time. *When recording in HQ (35 Mb/s) mode, recording time may be more than the above specified figure depending on the actual bit rate that is adopted during VBR encoding. The PMW-EX1R camcorder offers a wide array of recording formats for multiple content creation applications. In HD mode, scanning is switchable between 1920 x 1080, 1280 x 720, and 1440 x 1080 resolutions. Frame rate is also selectable from interlace and progressive - 59.94i, 50i, 29.97P, 25P, and native 23.98P*. In addition, 59.94P and 50P progressive recording is available in 1280 x 720 mode. In SD mode, both 50/60i and 25P/30P modes are supported. In addition to SD/HD video recording, high-quality audio is an equally significant feature in the XDCAM EX system. The PMW-EX1R camcorder records and plays back high-quality, two-channel 16-bit, 48-kHz linear PCM uncompressed audio. The PMW-EX1R has a built-in stereo microphone and two XLR audio input connectors for connecting professional microphones or feeding an external-line audio source. With the XDCAM EX series, recordings are made as data files in the MP4 format, which is widely used in a number of recent electronic portable devices and has been standardised by ISO. For SD recording, industry accepted .AVI type-2 files has been adopted. The file-based recording allows material to be handled with great flexibility in an IT-based environment - easily available for copying, transferring, sharing, and archiving. All these operations are accomplished without any "digitising" process required. File-based data copying allows for degradation-free dubbing of AV content, which can be performed easily on a PC or Mac. The file-based recording system also allows for material to be viewed directly on a PC or Mac - simply by inserting the SxS memory card into the ExpressCard slot, or by linking the device to the PMW-EX1R via an USB2 connection. This works in just the same way as a PC or Mac reading files on an external drive. The file-based operation can dramatically improve the efficiency and quality of professional video applications. By virtue of recording on flash memory card, the PMW-EX1R can start recording virtually the instant the camcorder is turned on. Moreover, the PMW-EX1R system automatically records on an empty area of the card - there's no danger of overwriting existing content. This is extremely convenient, as camera operators do not have to worry about accidentally recording over good takes, and they don't have to search through footage for the correct position to start the next recording. In short, it means the camera is always ready for the next shot! Each time a recording is started and stopped on the PMW-EX1R camcorder, the video and audio signals are recorded as one clip. During playback, users can cue-up to the next or previous clip simply by pressing the 'Next' or 'Previous' button, as you would do on a CD or DVD player. Furthermore, thumbnails are automatically generated for each clip as a visual reference, allowing operators to cue-up to a desired scene simply by guiding the cursor to a thumbnail and pressing the 'Play' button. For further convenience, the 'Expand' function allows one selected clip in the Thumbnail display to be divided into 12 even-time intervals, each with their own thumbnail identifier. This is useful if you want to quickly search for a particular scene within a lengthy clip. The PMW-EX1R is equipped with a superb Fujinon 14x zoom lens specifically designed for the PMW-EX1R to offer optimum picture performance. It offers a wide angle of view of 5.8 mm (equivalent to 31.4 mm on a 35 mm lens), and many other convenient features for diverse shooting situations. The lens adopts a newly developed and unique focus ring mechanism, which offers two types of manual focus, plus an auto focus operation. The PMW-EX1R camcorder is equipped with two independent focus wheel mechanisms, which can be switched by sliding the focus ring itself back and forth. When a cine-style lens or a stills camera lens is attached to the camcorder with a DOF (Depth of Field) adaptor, the image is usually rotated by 180 degrees. The Image Inversion function normalises the image for easy picture monitoring. This will also negate the need to flip the image in post-production. In addition to the unique focus ring, the PMW-EX1R camcorder is equipped with independent rings for zoom and iris adjustment. These are located adjacent to the focus ring, in the same layout as is common on shoulder-type camcorders. This gives users a high level of operational comfort and control. A One-push Auto Iris button has been added to the lens of the PMW-EX1R, allowing the user to go into Auto Iris mode only when this button is pushed. This is a feature seen on broadcast lenses and is used as a reference for camera operators when adjusting the iris settings. At the touch of a button, the centre of the screen on the LCD monitor and viewfinder can be magnified to about twice normal size, making it easier to confirm focus settings during manual focusing. The Peaking function can help operators to adjust the camera's focus more accurately by altering the way pictures are displayed on the LCD monitor and viewfinder. It can enhance the outline of the image, which the camera focuses on most, and change its colour to make it more visible. Enhance levels can be selected from a choice of "HIGH", "MIDDLE", and "LOW", and the outline colour from "RED", "WHITE", "YELLOW", and "BLUE". To minimize the blurring effect caused by hand-shake, the new lens incorporates an optical image stabiliser function that provides highly stable images. XDCAM EX compact camcorders are the first to be part of the legendary Sony CineAlta™ family. The PMW-EX1R offers native 23.98P* recording which, in combination with advanced creative features such as selectable gamma curves, makes this camcorder ideal for cinema production. *In 1440 x 1080/23.98P (SP) mode, images are handled as 23.98P and recorded as 59.94i signals through means of 2-3 pull-down. The PMW-EX1R offers a powerful Slow & Quick Motion function - commonly known as ‘over-cranking’ and ‘under-cranking’ in film shooting - that enables users to create unique 'looks' or special effects with slow- and fast-motion images. The PMW-EX1R can capture images at frame rates selectable from 1 fps (frame per second) to 60 fps in 720P mode and from 1 fps to 30 fps in 1080P mode, in increments of 1 fps. For example, when viewed at 23.98P, images captured at 60 fps will appear 2.5 times slower than normal. Conversely, images captured at four fps will appear six times faster than normal. With the Slow & Quick Motion function of this camcorder, images are recorded natively without interpolating the frames. This means the quality of the slow- and fast-motion images is extremely high and incomparable to those created in the editing process. In addition, these slow- and quick-motion images can be played back immediately after shooting, without using any converters or processing on non-linear editing systems. A new S&Q (Slow & Quick Motion) button has been added to the exterior of the camcorder. This allows the user to switch quickly between Normal mode and S&Q mode. In S&Q mode, a blue LED on the button lights up. When the switch is pressed, S&Q mode is activated, and the recording format and frame rate are instantly changed to the conditions previously set via the menu. The PMW-EX1R camcorder offers a Slow Shutter function for capturing clear images in low-light environments. This allows the shutter speed to be extended to a maximum of 64 frames. The Slow Shutter function not only increases camera sensitivity but also produces a special blurring effect when shooting a moving object, for enhanced shooting creativity. The shutter speed is selectable from 2-, 3-, 4-, 5-, 6-, 7-, 8-, 16-, 32-, and 64-frame periods. The PMW-EX1R camcorder offers a wide variety of gamma curves to flexibly handle contrast and give a specific 'look' to an image. In addition to four types of standard gamma curves, the PMW-EX1R provides four types of CINE Gamma (CINE 1, 2, 3, and 4), which are identical to those of other CineAlta™ camcorders. Operators can select the best-suited pre-set gamma curve, depending on scenes. Once enabled, Cache Recording continuously streams audio and video through the camcorder’s internal memory. Once the Record button is pushed, the content buffered in the camcorder’s memory is recorded onto the memory media at the start of the recording clip. The caching period can be adjusted by menu setting up to 15 seconds, so in a situation such as monitoring a developing situation, Cache Record enables capturing an event up to 15 seconds before the record button is pressed. When in Cache Recording mode, an indicator on the inside panel lights up. The PMW-EX1R camcorder offers an Interval Recording function that records signals at pre-determined intervals. This is convenient for shooting over long periods of time, and also when creating pictures with special effects of extremely quick motion. Frame Recording is a special feature of the PMW-EX1R camcorder that is especially useful for stop-motion/clay animation shooting. Using this function, images for pre-determined frames are recorded every time the Record button is pressed. In addition to the electronic shutter speed controls, the PMW-EX1R also has a "shutter angle" control - which is familiar to film users. By setting the shutter speed to "angle", the PMW-EX1R automatically operates with the proper exposure time, determined by the selected frame rate and the shutter angle. The Picture Profile feature allows camera operators to easily call up customised picture-tonal settings to suit particular shooting conditions, rather than having to readjust the camera each time - giving users greater operational efficiency. Up to six different picture-tonal settings such as the parameters of matrix, colour correction, detail, gamma and knee can be saved in the memory. These settings are displayed on the LCD monitor at the touch of a button. A Depth-of-field Indicator can be displayed on the LCD monitor and viewfinder to help camera operators easily recognise the depth-of-field of a scene, and thereby produce their desired images. The average brightness level of the centre of a frame can be displayed on the LCD monitor and viewfinder as a percentage. This is useful when a waveform monitor is not available for shooting. The PMW-EX1R is equipped with a newly developed, large, easy-to-view, colour LCD screen with a high resolution of 1920 x 480 pixels. The LCD screen is located in an easy viewing position on top of the camera and can be flexibly rotated according to shooting angles - which is convenient when using it as a viewfinder. When not in use, it folds underneath the housing for the built-in stereo microphone. The LCD Screen can also be used to instantly review recorded footage, as well as access the camera's set-up menus and view thumbnail display status indications such as audio meters, depth-of-field indicators, and the remaining memory and battery time. What's more, the Hybrid LCD screen - which comprises transmissive and reflective panels - offers clear viewing even in bright sunlight. *Viewable area measured diagonally. The PMW-EX1R comes equipped with a new 0.54-inch* colour LCD viewfinder, which displays high-resolution colour pictures of approximately 1,226,000 pixels in a wide-screen aspect ratio of 16:9, which simplifies focusing. Operators can switch between Colour and Monochrome Display modes, according to their preference. * Viewable area measured diagonally. The grip of the PMW-EX1R can rotate 90 degrees, which allows camera operators to flexibly adjust the angle of the grip. This gives users greater comfort during low-angle and high-angle shooting. In addition, the shape of this grip has been improved compared to the EX1 so as to better fit the user’s hand. In order to facilitate zoom control and recording operation during low-angle shooting, an additional zoom switch and record start/stop button are located on the carrying handle. The PMW-EX1R has a new zoom transition menu which allows camera operators to select ‘soft’ for smoother start/stop operation of the on handle zoom. The Shot Transition function allows for smooth automatic scene transitions. The operator can program start and end settings for zoom, focus, and white balance into the A/B buttons and, by pressing the start button, a smooth transition will take place according to the set time. It works by automatically calculating the intermediate values during the scene transition. The start of this function can be synchronized with the camera's REC start function. The ATW (Auto Tracing White Balance) function of the PMW-EX1R automatically adjusts the camera’s colour temperature according to changes in the lighting conditions. This function is useful when recording outside for long periods, and the lighting changes gradually over time. The PMW-EX1R also has a new ATW Hold function, which allows the operator to hold auto tracing at a desired colour balance via an assignable switch. With the supplied BP-U30 battery attached, the PMW-EX1R can record continuously for approximately two hours, while the optional BP-U60 battery extends the operating time to approximately four hours. 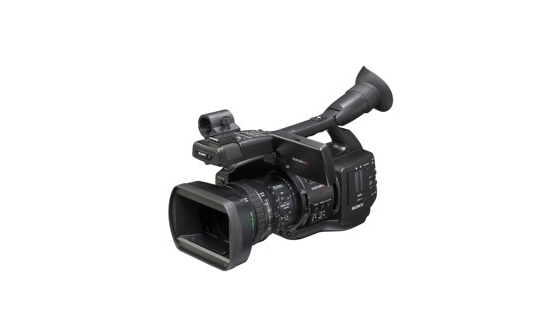 The PMW-EX1R camcorder comes equipped with a wide range of interfaces optimised for a variety of operational needs. These include an HD-SDI output, down-converted SD-SDI output, i.LINK (HDV/DV) input/output, USB2 and analogue composite/component output. There is also a HDMI output (Type A) that allows the user to show the picture on a consumer display or professional monitor equipped with an HDMI input. Non-compressed video and two channels of audio can be output. When HDMI output is selected, other outputs are not available. The PMW-EX1R has a new IR remote control receptor on the rear of its handle. This allows the user to control the PMW-EX1R with a Remote Commander both from the front and rear of the camcorder. The PMW-EX1R benefits from the addition of several new aspect markers such as 1.66:1, 1.85:1, 2.35:1, and 2.4:1 for more convenient cinematic operation. Only SxS PRO and SxS-1 are guaranteed for use with XDCAM EX Camcorders. Sony HX Series Memory Stick are supported with MEAD-MS01 Adaptor for certain functions (please see accessory page for details). USB based memory cards might work with the XDCAM EX range in some cases, but Sony does not guarantee that all the functions will operate. The performance of USB based memory cards can vary.